Five people from the same family were killed on Thursday in Lugansk as the basement they were taking refuge in, was shelled by Kiev government forces. Meanwhile in the center of the city, an Orthodox Church suffered bomb damage. While Gaza grabs most of the world’s headlines, the eastern Ukrainian city of Lugansk is suffering its own tragedy. Shelling by the Kiev government is becoming a daily routine for the petrified local residents, in a city, which was once the industrial heartland of Ukraine. 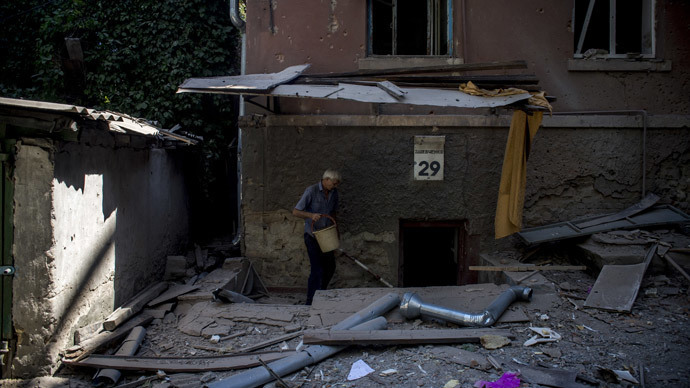 A family of five has been killed in the eastern Ukrainian city of Lugansk after the basement they were sheltering in was reportedly shelled by Kiev government forces. Grown men were in tears, as the fierce fire burned, others pleaded to try and help the family, which was trapped. However, there was little that anyone could do and eventually five charred bodies were dragged out of the ruins as the flames began to ease. 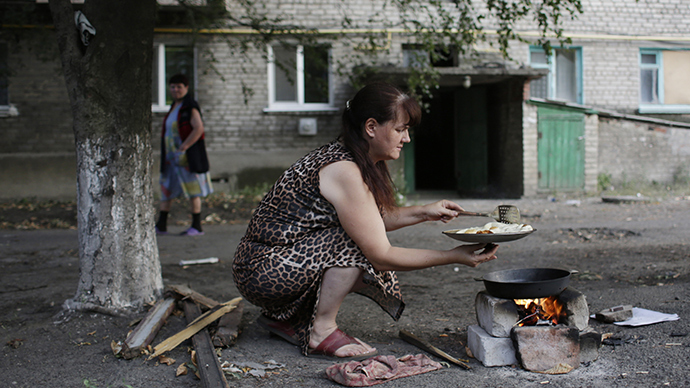 Lugansk is on the verge of a humanitarian crisis. The city is without electricity and water, as well as significant damage to communication. No banks are working, meaning pensioners are unable to receive their pensions, and there are no fuel reserves while the bombardment of the city continues. Meanwhile, Ukrainian government forces bombed an Orthodox Christian church in the center of Lugansk, according to the ITAR-TASS news agency. “The Ukrainian artillery launched a shell towards the church, the building was not completely destroyed, but the walls took a heavy impact,” said members from the self-proclaimed Peoples Republic of Lugansk, who also added there were no anti-government forces within a radius of a few kilometers of the church. 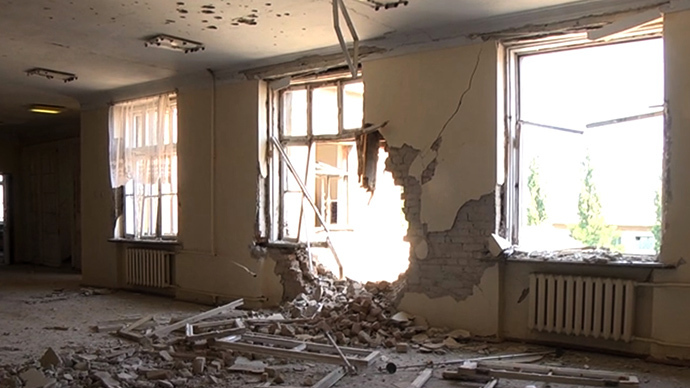 The church in the center of Lugansk was not the only building to take a pounding. Smart apartment blocks have been shelled by Ukrainian government forces, forcing local inhabitants to flee. The local hospital has also been hit, while water and gas supplies have been damaged. Even an elementary school in the city of one million could not escape the carnage, as many of the classrooms had been completely bombed out and covered in shrapnel. 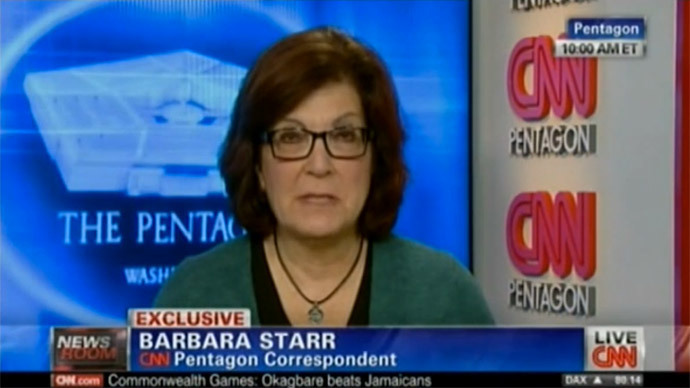 “States have an obligation to safeguard civilians and of course the larger the weapon - we are allegedly talking aboutballisticweapons that have very large war heads - puts even more onus and responsibility on those using the weapons to make sure they do not disproportionately harm civilians,” Shorebridge stated. “In these kinds of urban battlefields that mark eastern Ukraine, it is almost impossible to use these kinds of weapons, without harming civilians, so their use could very easily be described as a war crime,” the former army officer concluded.